A collaborative effort to ease the food desert in the Russell neighborhood, Oasis, opened Thursday to much fanfare and a sour bite of lemon. Oasis is a tiny store that has opened inside the Sisters Visitor Center at 2235 W. Market St. It’s a public-private collaboration between Buehler’s Cash Savers, Catholic Charities and Dare to Care Food Bank. 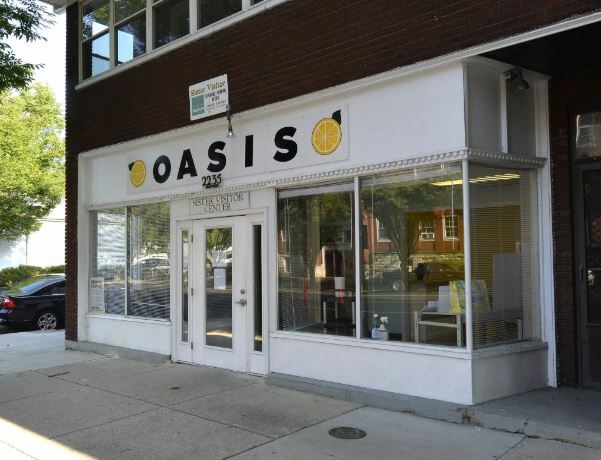 The store is open to everyone, and instead of just being the corner store, Oasis sells dry staples and healthy frozen food, such as frozen vegetables, at just slightly above wholesale. Matt Dills, owner of Cash Savers and other small grocery stores in the area, said he got the idea when he was about to open a West End location and saw there was a small tent city of homeless people behind the store. Dills met with city and faith leaders around the community to find a way to help people in the Russell neighborhood. Dills called the Russell neighborhood a “fresh desert” because options for fresh, healthy food are limited. Oasis is not a full-service grocery. It’s just a small store to help fill in the gaps between Dare to Care’s food bank and the full-price grocery. By working with the Catholic Charities’ Common Table Culinary Arts Program directly across the street, the store has prepared rice and beans available free to anyone who is hungry. The store also has recipes available to go along with the offerings in the store, so that if a person doesn’t know what to do with the food they buy, they can get some culinary inspiration. The recipes are provided by the Common Table program. Mayor Greg Fischer said that food deserts are a difficult problem because groceries are getting bigger and moving out of neighborhoods, but this project reflects the compassion of Louisville. The grand opening ended with a Lemon Challenge, which encourages people to use lemons instead of table salt. The two have a similar flavor profile, but lemons are healthier. The challenge, which involved the politicians and community leaders present bitting into lemon slices, also aimed to bring awareness to the problems of hunger and food deserts.